Rt. 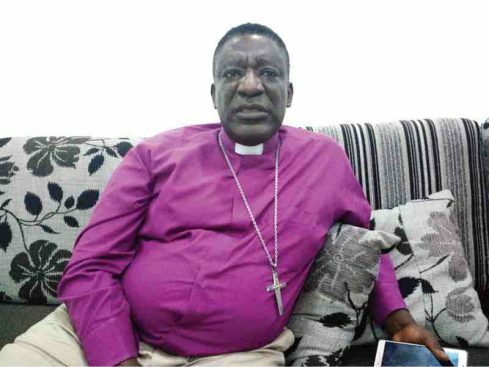 Reverend Markus Madugu Dogo, the Anglican Bishop of Kafanchan Diocese in an interview with DAILY TRUST, says that those using religion to justify crime are illiterates. He also accused Kaduna government of injustice over killings in the Southern part of the state. DT: How can religious leaders or scholars help maintain peace in society? Rt. Reverend Markus Madugu Dogo: Religious scholars or leaders have a vital role in keeping peace and order in the society. Now, most of the major problems we have in Nigeria that have to do with religious terrorism, conflict or fanaticism are because of lack of good scholarship. Many of us in Nigeria are either Muslims or Christians but we lack full knowledge of our religions, and what happens at the end of the day is dissemination of wrong information that end up in crisis. DT: There is strong allegation that religious leaders in Nigeria are manipulated by some politicians, how true is this? Dogo: It is very true. For me, here as a religious leader in Kafanchan, everybody knows, and God judges me that anything that has nothing to do with peace I’m not participating. Part of my responsibility as a religious leader is that the Bible demands that I should respect every constituted authority and I am. Two, I also have the task of always saying the truth. The worst thing is how many scholars can stand up and tell the leadership the truth? If a politician comes here and says he wants to greet the bishop and brings one million naira to me and I collect, how can I have the courage of telling him the truth? Religious leaders are manipulated because they are looking for materials things. As for me, I have never done any program in Kafanchan and asked any politician for financial assistance for my church or personal activities. DT: Kaduna State and especially the southern part have witnessed security challenges, what do you think are the major causes? Dogo: Let me go back to 2011 when I was posted to Kafanchan after the post-election violence. One of the things that government kept saying was that they would bring the culprits to book and punish them, that didn’t happen. When the APC governor came, he swore in so many places that he was going to deal with the perpetrators, since 2011 to date nobody has been arrested. About herdsmen and farmers clashes, you cannot take away the hands of our politicians from it. I want to see a situation where anybody who does wrong is punished. Why are you sparing evil doers? When somebody is not punished he will continue doing bad things. Let’s assume you get drunk and drive a car in the US, if you hit somebody you cannot say, sorry it’s a mistake and go, even if the person you hit has forgiven you the law will still hold you. Now, if you talk about the factors that contribute to farmers, herders crisis, it is part of it. If there is a fight between farmers and herdsmen, go and punish those who are wrong, they won’t do it again. If somebody in authority refuses to punish the evildoer, what is his feeling? Is it because of his relationship or because of his religion? Now people talk about discrimination. This is the major factor. Let evildoer be punished! We have community leaders, let’s start from there. These farmers and herders live together. If somebody does a wrong thing bring him to the leaders and resolve the dispute there. If the person understands his mistake and asks for forgiveness you can forgive him and if the person offended needs compensation, let the offender compensate him. But a situation whereby that is not done, no room for discussion and reconciliation enhances crisis. DT: What would be your advice to youths as we are approach electioneering time? Dogo: Everybody knows that youths have the greater percentage of the Nigerian population. The future of Nigeria is in our hands, and whatever a man sows he will reap. Now my advice to the youths is that if the person you voted for is doing the right thing then vote for him again and if you are not happy or satisfied with him then vote him out. Nobody is a God in Nigeria. I’m also advising the youths not to take the law into their hands in whatever circumstance. I told the people in my church that since everybody has his own party and I am not against that let everybody go and vote for his choice but if you make a wrong choice it will affect you and your generation. DT: What would be your advice to those using religion to justify crime? Dogo: They are illiterates; they don’t know what the teachings of religion are. How can you use religion to justify criminality, for God’s sake? Now, for instance, if somebody does wrong, which religion asks you to go and hide that person and continue supporting him? Honestly, this shows how fanatical we are! It happens in Christianity, it happens in Islam and people are wrongly indoctrinated. If anybody is doing that he is disserving humanity and God. Whatever you do, you will one day stand before God and will be answerable to Him. If you wrongly motivate people and tell them to go and fight just because of religion you are wasting your time. The worst of it now is that if you look at the political parties we have, they are trying to divide the parties according to religious line. Politicians make religion their constituent.